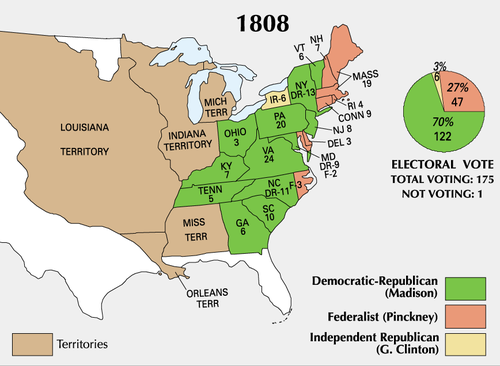 For related races, see 1808 United States elections. Presidential election results map. 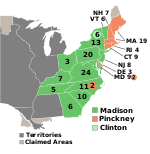 Green denotes states won by Madison, burnt orange denotes states won by Pinckney, light green denotes states won by Clinton. Numbers indicate the number of electoral votes allotted to each state. Nominations for the 1808 presidential election were made by congressional caucuses. With Thomas Jefferson ready to retire, supporters of Secretary of State James Madison of Virginia worked carefully to ensure that Madison would succeed Jefferson. 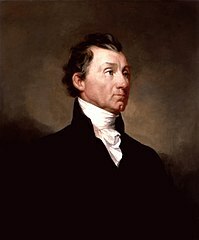 Madison's primary competition came from former Ambassador James Monroe of Virginia and Vice President George Clinton. Monroe was supported by a group known as the tertium quids, who supported a weak central government and were dissatisfied by the Louisiana Purchase and the Compact of 1802. Clinton's support came from Northern Democratic-Republicans who disapproved of the Embargo Act (which they saw as potentially leading towards war with Great Britain) and who sought to end the Virginia Dynasty. 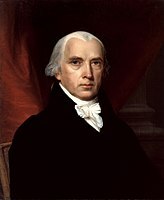 The Congressional caucus met in January 1808, choosing Madison as its candidate for president and Clinton as its candidate for vice president. Many supporters of Monroe and Clinton refused to accept the result of the caucus. Monroe was nominated by a group of Virginia Democratic-Republicans, and although he did not actively try to defeat Madison, he also refused to withdraw from the race. Clinton was also supported by a group of New York Democratic-Republicans for president even as he remained the party's official vice presidential candidate. The Federalist caucus met in September 1808 and re-nominated the party's 1804 ticket, which consisted of General Charles Cotesworth Pinckney of South Carolina and former Senator Rufus King of New York. The election was marked by opposition to Jefferson's Embargo Act of 1807, a halt to trade with Europe that disproportionately hurt New England merchants and was perceived as favoring France over Britain. Nonetheless, Jefferson was still very popular with Americans generally and Pinckney was soundly defeated by Madison, though not as badly as in 1804. 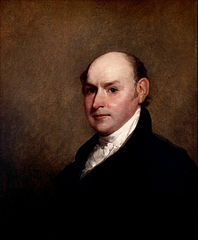 Pinckney received few electoral votes outside of New England. 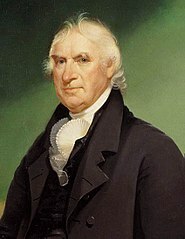 Pinckney retained the electoral votes of the two states that he carried in 1804 (Connecticut and Delaware), and he also picked up New Hampshire, Massachusetts, Rhode Island, and three electoral districts in North Carolina besides the two electoral districts in Maryland that he carried earlier. Except for the North Carolina districts, all of the improvement was in New England. Monroe won a portion of the popular vote in Virginia and North Carolina, while the New York legislature split its electoral votes between Madison and Clinton. Source (Popular Vote): U.S. President National Vote. Our Campaigns. (February 10, 2006). Source (Electoral Vote): "Electoral College Box Scores 1789–1996". National Archives and Records Administration. Retrieved July 30, 2005. (a) Only 10 of the 17 states chose electors by popular vote. (b) Those states that did choose electors by popular vote had widely varying restrictions on suffrage via property requirements. (c) One Elector from Kentucky did not vote. Results by county explicitly indicating the percentage of the winning candidate in each county. Shades of blue are for Madison (Democratic-Republican), shades of yellow are for Pinckney (Federalist), and shades of green are for Monroe (Democratic-Republican). ^ "National General Election VEP Turnout Rates, 1789-Present". United States Election Project. CQ Press. Archived from the original on November 14, 2016. ^ Sabato, Larry; Ernst, Howard (January 1, 2009). Encyclopedia of American Political Parties and Elections. Infobase Publishing. pp. 302–304. ^ a b Ammon, Harry (1963). "James Monroe and the Election of 1808 in Virginia". The William and Mary Quarterly. 20 (1): 33–56. JSTOR 1921354. ^ a b Kaminski, John P. (1993). George Clinton: Yeoman Politician of the New Republic. Rowman & Littlefield. pp. 281–288. Retrieved October 12, 2015. ^ Deskins, Donald Richard; Walton, Hanes; Puckett, Sherman (2010). Presidential Elections, 1789-2008: County, State, and National Mapping of Election Data. University of Michigan Press. pp. 49–50. ^ "A New Nation Votes". elections.lib.tufts.edu. Archived from the original on May 13, 2018. Wikimedia Commons has media related to 1808 United States presidential election. "A Historical Analysis of the Electoral College". The Green Papers. Retrieved March 20, 2005. This page was last edited on 22 April 2019, at 01:54 (UTC).